In this walkthrough I want to show you how to create a Sequential Workflow with Visual Studio 2010 for use in SharePoint 2010. – I will show how to create a custom Task Form for interaction with users. The Task form will be a native SharePoint list form. No InfoPath. There are many InfoPath samples out there but they cannot be used on a SharePoint Foundation 2010 platform. But workflows can be used on SharePoint Foundation 2010 too! To reproduce the following steps you need to create a SharePoint site. – In the walkthrough I’ll use a Site Collection located at “http://sharepoint.local/sites/workflow”. 1. We create the Site Collection. Use the “Blank Site” site template. We create it with “Deploy as farm solution” and specify the location “http://sharepoint.local/sites/workflow/”. 4. First we need to create an instance of the Workflow History list that is needed for the workflow. Create a new “Empty Element” project item named “Workflow History”. Open the created “element.xml” file and modify it as shown below. The “TemplateType” attribute represents the “Workflow History” list template. It resists on a SharePoint feature with ID “00BFEA71-4EA5-48D4-A4AD-305CF7030140”. It’s a native SharePoint feature. You can add the attibute “Hidden” to the “ListInstance” tag and set it’s value to “TRUE” to hide the list as it’s done by SharePoint by default for this list. In this case you should also change “OnQuickLaunch” to “FALSE”. For my demo purpose I want to have “Workflow History” visible and on the Quick Launch bar. 6. We create the SharePoint fields for “Workflow 1”. Therefore we create another “Empty Element” project item named “Workflow 1 Fields”. I’ll create 3 fields for use in the Task Form we will create: Test1, Test2, Test3. They are all fields of type Text. 7. Now we create a new “Module” project item named “Workflow 1 Forms”. In this module we will store the Task Form. Remove the “Sample.txt” file from the created module. Create a new “Application Page” project item named “Task1Form.aspx”. This project item will stored in the folder “Layoutsik.SharePoint2010.Workflow”. Move the project item “Task1Form.aspx” using Drag & Drop into the module “Workflow 1 Forms”. Remove the “Layouts” folder from the project. It should be empty. First we need to edit the “Page” tag of the ASPX site. Now we insert the following code into the “PlaceHolderMain” content placeholder. 31:                                         <SharePoint:FieldDescription runat="server" ID="ff1description" FieldName="Workflow1Task1_Test1"
41:                                         <SharePoint:FieldDescription runat="server" ID="ff2description" FieldName="Workflow1Task1_Test2"
51:                                         <SharePoint:FieldDescription runat="server" ID="ff3description" FieldName="Workflow1Task1_Test3"
Now we add some ASP.NET code into the “PlaceHolderPageTitle” content placeholder. Furthermore we add this lines of code into the “PlaceHolderPageTitleInTitleArea” content placeholder. At least we add the following code into the “PlaceHolderAdditionalPageHead” content placeholder. You can see the input fields for the three fields of Task 1. Furthermore you see three buttons. For them we now create some “code behind”. We need to modify the “Elements.xml” file of the module named “Workflow 1 Forms”. This specifies there to store the “Task1Form.aspx” file in the site structure. 9. In the next step we create the task list that will contain our workflow tasks. First create a “List Definition” project item named “Workflow 1 Tasks”. 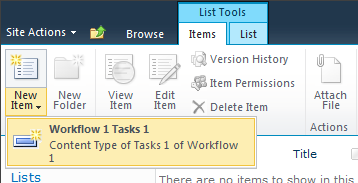 Use “Workflow 1 Tasks” as name of the list definition and “Tasks” as base type. Check “Add a list instance…”. 10. Now open “Elements.xml” of the new list definition project item. We need to change the identifier of the list type we create! – It must be “107”. This is the list template ID for workflow tasks lists in SharePoint. The workflow designer will search for a list with this type inside the site where a new workflow will be created. 11:  Description="Tasks of Workflow 1"
Here we also need to modify the type identifier to “107”. Furthermore we change the list url: “Lists/Workflow1Tasks”. 3:  <ListInstance Title="Workflow 1 Tasks"
In a “real world” scenario we would prevent the list from being listed on the Quick Launch bar. So the corresponding parameter must be set to “FALSE”. 12. Now we need to modify the “Schema.xml” file of the list definition. 1: <List xmlns:ows="Microsoft SharePoint" Title="Workflow 1 Tasks"
Now remove the the content types defined in the “ContentTypes” tag in the “schema.xml” file. 2:  Name="Workflow 1 Tasks 1"
You see the “FormUrls” tag? Inside this tag we specify our custom form template we created before. The new content type is derived from the “Workflow Task” content type 0x010801. – In the “FieldRefs” section we add our fields we need inside the workflow. 3:  StaticName="Completed" Group="Base Columns" Type="Boolean"
14. Now deploy the project. Check “Do not prompt…”. Press “Resolve Automatically” – it’s your only option . 15. Have a look into the site using the browser. – We will test our “Edit” form. Remember that we did not specify special “New” form or “Display” form. This you could do the same way as you created the “Edit” form. We see our lists in the Quick Launch. Enter some data and press “Save”. Open the item in “Edit” form. Now you should see our custom list form. If you click “Save As Draft” your changes will be stored in the task item. If you click “Complete Task” two item fields will be changed in addition to the changes made in the form: It sets “Status” to “Tasks_Completed” and “% Complete” to “100”. You can see this in the Code Behind file of the list form. You see: “% Complete” is set to “100 %”. So far our projects works as expected. See Part 2 for the next steps… There I will show you how to create a simple Sequential Workflow that uses our Task Form. Manage to follow this walktrough, and it gave me error when I tried to save the task. 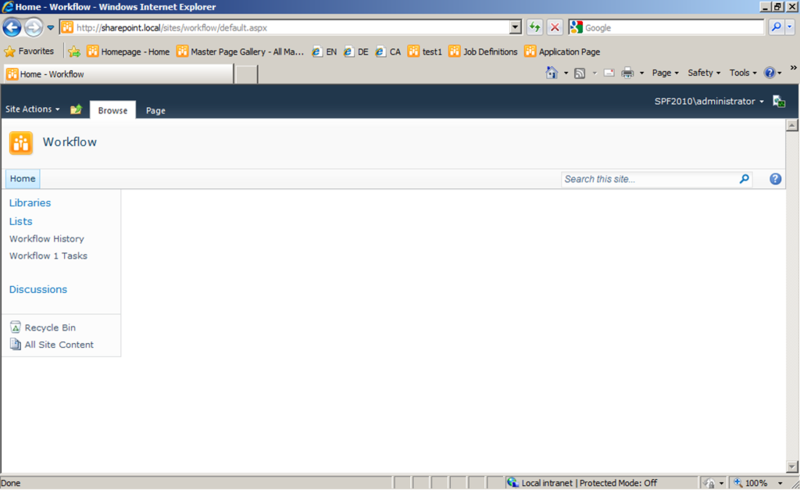 I am using SharePoint 2010 Enterprise. I change it to ‘0’ and the error is gone. Parser Error Message: The attribute ‘autoeventwireup’ is not allowed in this page. And it also happen to the sample for this article that you’ve share on codeplex, have any idea why? this is strange! – Of course I’ve tested the solution before I deployed them to Codeplex. For me everything works fine. Did you remove the attribute from the Task1Form.aspx files “Page” tag? Yeah my bad, I forgot to change the aspx 🙂 It’s working now. Thanks. I have other question though, How do you send value from Workflow to the form? (I’ve tried ExtendedProperties but I don’t know how to access it inside the form. Do I have to modify the Task Custom Fields directly? Just found out how, I don’t realize that we have to use Field Guid to populate the custom-fields using CreateTask ExtendedProperties. So basically to pass value to the custom task we have to use Field Guid on the ExtendedProperties. In step 13 in the xml code, the default tag (line 6) has a space before the word FALSE. thanks for the information! – I see there are some mistakes like this: Too much spaces. I encountered this error in a post and figured out that the Visual Studio 2010 Extension that I used for Copy’n’Paste was buggy: Spaces in XML node content and attributes, incorrect closing tags in HTML… I’ve solved the bug in the extension (“code4blog v1.4“) but I forgot to fix this post. I’m sorry. No problem at all. This is an awesome blog. The only one of it’s kind on the internet and has been particularly helpful. Any good way to trouble shoot getting a 404 error when you try to edit the task item? Obviously a path mismatch somewhere but everything looks the same every place I look. I think it’s an incorrect setting in the modules elements.xml file. after you deployed the project have a look into sharepoint designer and go into “all files”. you should see the module you deployed in the VS project. I think you have deployed URLs at two points: in the module and in the file definition. in the sharepoint designer you should see that you have “too much” URL parts. The file /LeaveRequestWorkflowForms/masterurl/default.master does not exist. Do you have a “~” at the beginning of the string value of the attribute “MasterPageUrl” of the “Page” tag of your form? I have implemented your tutorial 1. Strangely, when I want to edit my task, the custom fields do not display their values. When I display the form before clicking Edit button, the values are there. Something wrong? Can you verify that you use the same form on A) select list item -> edit list item or B) select list item -> display list item -> edit list item ??! If it’s the same I’ve no idea! – You could send me the source code, if you like. Please keep me up to date on this! Was able to get the task edit form up and save changes. However when clicking the “Complete” button on the edit form, it says the task is locked by a running workflow and cannot be edited. I received this error because I changed the status to “Completed” which is one of the valid values for the status column. By using the value you have “TASKS_COMPLETED”, it works. Unfortunately this is NOT a valid value. Microsoft should probably be notified of this bug! Can you explain how this solution would change to deploy to a subsite instead of a collection level site? What is the field “Completed” used for? Since it is not populated in the code, it just receives a “FALSE” setting and will never be changed. Can this field just be left out? The status is set to “Complete” for the task. I think I answered this one. When we built the content type, we inherited from Task and changed the base type to 107. This is because workflow task is a hidden content type. To adapt this new content type to a workflow task content type, this field needs to be included. It’s an internal field that is required but not used for our purposes. I am curious why TASKS_COMPLETED is the value set for status since this is not a valid value in the list of choices for the status field? In fact, if you set the value to “Completed” which IS one of the valid values, it blows up. This is really confusing. Not sure how you figured this value out since it is not valid! My task list now shows a value that is not in the list of choices. Nice! I’m not really sure how the task status works. When setting the value in the code behind, it’s set to “TASKS_COMPLETE” which populates the actual value on the take with “TASKS_COMPLETE”. I think the objective is to use the RESOURCE:CORE TASKS_COMPLETE variable which has a value of “COMPLETE”. 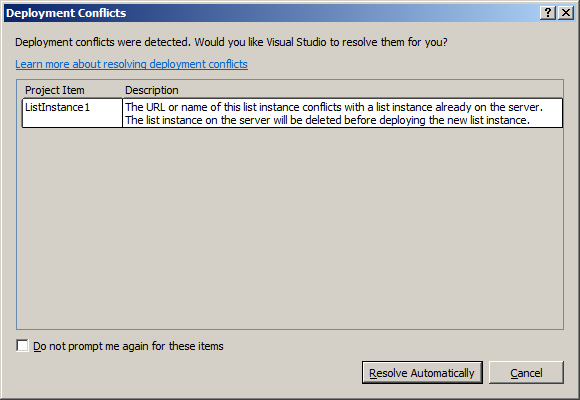 Ideally, the value of the status column would be “COMPLETE” and not “TASKS_COMPLETE” since this is not valid. Any ideas on how to reference the $resources:core TASKS_COMPLETE variable value? I am getting a “page not found” error. I have checked the path in my element.xml in my module and everything seems to be ok. Please check the 14-hive in the file system and search the page in the site structure with SharePoint Designer 2010. – Can you find the page? Can you access them by specifying the page url in the browser directly? Please fix ” FALSE” to “FALSE”. Thank you, Alex! – I’ve fixed this! I keep getting “file not found” error when I try to open the edit form. Any Idea of what could it be?? Please check your “Module” project item. (Step 8). There must be a wrong definition for that. You should check the 14-hive in the file system whether the form is there. Also check the file with SharePoint Designer 2010! I have checked all that and everything looks OK. The file /sites/workflow/Workflow1Forms/masterurl/default.master does not exist. Hi! – I can’t see the Page tag in your comment… – Please check it againt the source code I’ve published. I think the MasterPageFile attribute is wrong. Do you have a “~” before “masterurl/default.master” = “~masterurl/default.master”? Just a Question , Why can’t we design form in SPD and create User Controls for Buttons ? I think that would be easier and saves lot of time. For the error, “This task is currently locked by a running workflow and cannot be edited”, you might not be able to use it in part 2 because OnTaskChanged activities NOT to be triggere. I got this error, “Task is currently locked by a running workflow and cannot be edited”, when I tried to edit the task form the 2nd time. The 1st time I press the save as draft button, it works. The 2nd time i clicked on it, this error comes up. Do you have any idea? Thanks. nice article, i hav jst implemented this..
but i get an Error like : ” is not a valid identifier. i had followed as u mention in ur project. i’l check twice the code.. But im unable to fix..
its NS again.. this error occur when an item is edited in list. Great post. Helped me a lot! For people that create a Site Content Type instead of a List Content Type: Make sure you have not set Inherits=”TRUE” in the ContentType definition. Otherwise, the FormUrls Element will not be used and you will still get the default form when editing the Task. Thanks for good article, however, when I grant permission for a user with contribute permission on this task item, this user has limited access permission on this site, then this user just be view this task item and cannot edit this task item, when user edit this task item then a error message “Error: Access Denied” will be displayed. Could you give me some solutions to solve it. It would have been nice if there was the option to copy and paste code elements without having the line numbers. I should have said this earlier: Thank you for taking the time to bring this to us. It is greatly appreciative. ideas… Simple to read and inclusive of very helpful know-how! Thanks for sharing Walkthrough: Creating a simple Sequential Workflow with a custom Task Form in SharePoint 2010 using Visual Studio 2010 (Part 1 of 2) « Ingo Karstein’s Blog! The 404 is a problem from the Elements.xml of the Form Module. Path="Workflow 1 Forms/Task1Form.aspx" Url="Workflow 1 FormsTask1Form.aspx"
Can you tell why you use SaveButton.SaveItem(..) method instead of item.SystemUpdate(…) ? the image can’t be displayed? ?